US automobile major Ford is stepping on the gas in China, the world’s largest auto market. Can it catch up with rivals General Motors and Volkswagen? In December 2013, an enormous red dome appeared on the banks of the Huangpu river in Shanghai. Nearly 450 people converged under this dome, and watched spellbound as a 360-degree screen projected dazzling images. And with great fanfare, Ford Motor Co. launched the all-new Mustang. Auto enthusiasts are used to high-decibel car launches such as this one. The glamor, glitz and festivity is now pretty much de rigueur. Yet the Mustang launch was special for one reason. It signaled very clearly that China was now a key market for the Dearborn, Michigan-based automaker: the Shanghai launch event was one of the six global events occurring simultaneously in Sydney, New York, Los Angeles, Dearborn and Barcelona. The year 2010 marked a clear turning point in the history of the automobile industry. For the first time in 120 years, the US market was no longer the biggest. In a special report published in September 2013, American financial services company Standard & Poor’s (S&P) called it a “shift in the balance of power in the auto industry”. The scale had tilted in favor of the emerging markets led by China, India, Brazil and Eastern Europe. Together they accounted for slightly more than one half of the 73.2 million light vehicles sold worldwide in 2010! The share of emerging markets has steadily grown since–in 2011 it was 52%; in 2012, 54%; and in 2013, 55%. Clearly, this trend held promise. And China, having overtaken the US, has emerged as the largest single-country, new-car market. Demand shot through the roof, telling the best of analysts how conservative their estimates had been. McKinsey & Co in its report, Bigger, Better, Broader: A Perspective on China’s Auto Market in 2020, estimated sales in China to touch 22 million in 2020. Way too late, considering that China came pretty close to achieving that feat in 2013 itself. If estimates by the China Association of Automobile Manufacturers (CAAM) hold true, the market will grow by 10% this year, taking the sales figure over 24 million. McKinsey’s findings stemmed from the optimism imbued in the Chinese economy and those factors are still intact. Between 2011 and 2020, the Chinese economy is expected to continue growing at 7-8% annually; the percentage of the population residing in urban areas is expected to rise from 51% to 60%, thus giving a fillip to mobility demands; and the number of high-income urban households is likely to expand from 17% to 58%. Neil Wang, Partner and Managing Director for business consulting firm Frost & Sullivan, China, reiterates: “China has become one of the most important markets for all global car manufacturers as most of them are facing a decline in demand caused by severe economic downturn.” As the recession set in, the Big Three–General Motors (GM), Ford and Chrysler–faced tremendous heat in the US. Unlike GM and Chrysler, Ford abstained from filing for bankruptcy and instead took a $23.5 billion secured loan by putting its iconic blue oval logo as collateral. Calling China a savior may not be wrong. Consider GM’s vehicle sales volume for year 2010–73.6% of it was generated outside the US, including 43% from emerging markets, such as Brazil, Russia, India and China (BRIC). For Ford as well the Asia-Pacific and Africa region (APA) is the fastest growing. By the end of this decade, it expects 60-70% of its growth to come from APA. China undoubtedly remains the star of the region. Bill Russo, President and CEO of Synergistics Ltd., an automotive consultancy based in China, agrees on China’s prospects. “Urban middle class population and GDP levels will continue to rise, driving expansion. Rising wealth will continue to allow for a strong mix of premium models. Moreover, Chinese consumers favor famous foreign brands. Three out of four passenger cars sold in China carry a foreign brand.” According to CAAM too, the market share of Chinese brand passenger cars has continued to decline, making China the best bet for foreign players like Ford, GM and Volkswagen. Ford China, one of the frontrunners eagerly seeking to tap China’s potential, is upbeat. The company sold 935,813 wholesale vehicles in China in 2013, a 49% increase over the previous year. John Lawler, Chairman and CEO of Ford China, interpreted the impressive performance as a “demonstration” of the continued progress of Ford’s “aggressive China growth strategy”. Interestingly, the American auto major has pretty much adhered to the same strategy with which it entered China about two decades back–leveraging its global assets while simultaneously investing in local capabilities to bring a full line-up of vehicles. Research helped Ford understand that discerning Chinese customers keep in mind a number of factors before buying a car–fuel economy, design, how the vehicle matches their personality, etc. “(A) car is a major purchase in life, especially in China… it is a whole family affair where everyone, right from the buyer’s spouse to kid to parents, comes for the test drive and acts as a major influencer,” says Lynn Ouyang, a communications executive at Ford Asia Pacific. Next steps followed. Regular surveys were conducted to understand customer’s preferences. Ford embedded Chinese and Indian engineers in product development groups so that local tastes could be designed into its vehicles. “The Chinese prefer robust back seats for sedans, plush leather, more in-car entertainment options… At the same time China is a very cost-conscious and diverse market,” adds Ouyang. In adherence with the global One Ford plan (introduced in 2008, the One Ford plan seeks to balance Ford’s cost structure with its revenue and market share, accelerate development of new vehicles that customers want, finance Ford’s plan and rebuild its balance-sheet, and work together to leverage its resources around the world), Ford’s portfolio in China was created to include a full family of vehicles–small, medium and large. From performance vehicles (Focus ST, Fiesta ST), and sport utility vehicles (Explorer, Edge, Kuga, EcoSport), to sedans (Mondeo, Focus, Fiesta, S-MAX) and commercial vehicles (Transit). In March 2012, while launching the Focus, Ford vowed to bring 15 new vehicles to China by 2015. So far, the plans seem to be on track. Last year Ford launched seven new vehicles in China—Focus ST, Fiesta ST, Explorer, Kuga, EcoSport and the all-new Ford Mondeo. Focus, the sporty mid-size car, turned out to be the game changer for Ford. A bestseller, it led the fleet in 2013 as well with 403,640 wholesales (cars sent to dealerships) sold, up 36% over the previous year. It helped that Ford became the lead sponsor of singing reality show Chinese Idol and was able to connect with the masses. It was a tried-and-tested marketing strategy (Ford also sponsors American Idol in the US) that, Ouyang says, worked well in China as well. In terms of marketing strategy, Ford has also decided to have a pretty robust online presence in order to gain the attention of the 600 million internet users in China. But anyone who has travelled to China knows that it is not just a country of the masses. According to a Research and Markets report titled Global Luxury Car Market: Trends & Opportunities (2012-2017), by 2017, the US and China will collectively represent 50% of the global premium opportunity in automobiles. Keeping this in mind, Ford is drawing up plans to introduce the Lincoln brand, a line that has a history spanning a century, in the latter half of this year. These cars will be imported and distributed through an all-new independent Lincoln brand dealer network. Ford’s vision for Lincoln in China is ambitious. “(The idea is) to attract luxury car buyers and offer a very personalized connection with the dealer, that individual touch which makes the brand different,” says Ouyang. Ford’s roadmap for the future remains unchanged–refreshing the product lineup, expanding the dealer network, and enhancing the production capacity. As part of its strategy, it is looking at strengthening the regional operation by locating its Asia-Pacific team in China. Ford has been operating in China through two joint ventures (JVs): Changan Ford Automobile (CAF) and Jiangling Motors Corporation Ltd. (JMC), which assemble Ford and JMC vehicles for distribution in China. It sure is shifting gears and getting into the fast lane here. “China is the world’s largest growth market, and we expect tier 4 to tier 6 markets to see the greatest growth over the next five years. To cater to the diversified needs, we will further expand our vehicle offerings to increase our market coverage in China from 22% in 2009 to 50% in 2015. We will also more than double the number of CAF dealerships from 340 (as in 2010) to 700 by 2015. JMC dealerships will also almost double from 116 in 2010 to 220 in 2015,” adds Ouyang. Ford has planned to open most of the new dealerships in tier four to tier six cities. Each dealer is chosen with utmost care–one that offers high level of customer service and does not hard sell to customers. China’s auto market is not an easy one to navigate. Bill Russo of Synergistics Ltd. says the first order drivers of success in the market can be linked to product relevance and brand acceptance which are often the barriers to market entry. “While these are essential, the secondary drivers of success are more complex,” he says. These include local partner strategic alignment, JV management, R&D localization, competitive cost structure/local sourcing, manufacturing localization, and distribution network capability (for sales and service). According to Russo, the market leaders are Volkswagen (with SVW and FAW-VW/Audi), General Motors (with SGM and SGM-Wuling), Hyundai (with Beijing Hyundai), and BMW (Brilliance-BMW). “More recently, Ford has gained ground because they are investing in introducing new products which allows them to clear the first-order drivers of success,” he adds. Here’s a glimpse: Ford has invested over $4.9 billion in China and employs over 26,000 people in its wholly-owned entities and JVs. It currently has nine plants in the country, including three new plants and a research and engineering center under construction. Success in terms of financial returns is difficult to judge because Ford does not break up its revenues country-wise. 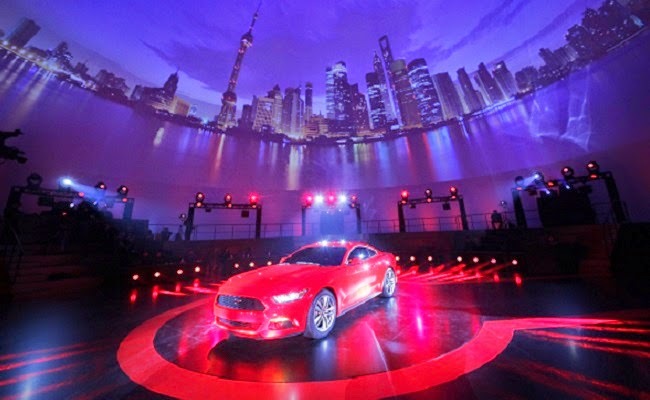 “Ford Asia Pacific will account for 60-70% of the company’s growth in the next 10 years. China is a big part of it,” says Ford’s Ouyang. For the rising environmental concerns, Ford banks on technology to improve fuel efficiency and reduce carbon dioxide emissions. It is working towards bringing 20 new powertrain products to the country and improving fuel economy by up to 20% (compared to 2010) by 2015. Despite the fact that Ford entered China almost two decades back, it has much ground to cover before it can inch closer to GM and Volkswagen, the two players that currently lead in China. The two early birds started investing heavily in China in the 1990s, long before Ford. But for now, there is no denying that Ford is playing the catch-up game pretty well. Under the pressure of environment protection and energy structure, China has paid great attention to the development of energy saving technology and new energy vehicle industry. Sales of China’s new energy vehicles reached 6,853 units in the first quarter of 2014, a year-on-year growth of 120%, but still lagged far behind the target. Meanwhile, technologies and applications of new energy vehicles are quite different from those of conventional vehicles. Do we need new market mode and what shall we do in terms of system construction to stimulate the growth of new energy vehicle market?